Fully automatic Rotary Bottle Rinsing, Filling and Capping Machines are mainly used for mineral water / carbonated beverages. 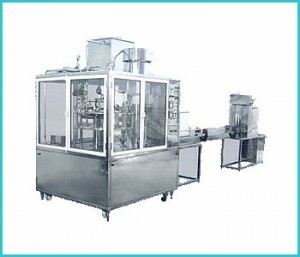 The entire process has provisions in the filling machine for rinsing, filling, capping and sealing automatically. The entire process is fully computerized with PLC and sensor Control with one touch instrumentation. It is capable of bottling various sizes of bottles ranging from 500 ml to 2 Ltrs. The mineral water / bottles are fed into the input feed conveyor.